Nik Kershaw returns to The Apex after his visit on his popular "Me, Myself and I tour" in 2014, celebrating over 30 years since his first chart success. Nik Kershaw was made famous by his string of pop hits in the eighties, including ‘Wouldn’t it Be Good’, ‘I Won’t Let The Sun Go Down On Me’ and ‘The Riddle’. His debut album 'Human Racing' in 1984 achieved multi- platinum sales and launched his career worldwide. In 1990, after four MCA albums and sales of over eight million, Nik left the spotlight to concentrate on song-writing and producing, working with Elton John, Chesney Hawkes, Cliff Richard, Bonnie Tyler, Lulu, Ronan Keating and Gary Barlow, amongst others. Nik will perform songs and stories from his impressive career, in this is a rare opportunity to experience an intimate evening with the man, famously described by Elton John as, "the best song writer of a generation". The gig at The Apex is on Wednesday 20 September at 7.30pm. 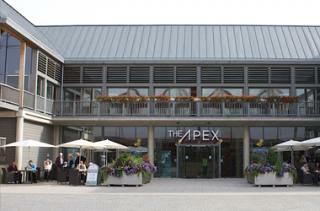 Tickets are £23, ring the box office on 01284 758000 or see the website, www.theapex.co.uk for details.